February's Inspiring Great Retail report was all about imaginative, memorable and genuinely helpful customer communications. If carefully considered, they can build brands, create live-long customers and if you're lucky, generate some positive PR to boot. If you've not yet read the report you can do so here. We highlighted some of the retailers that are getting it right and inspiring the rest but we know there's lots of impressive retailers out there so we asked you to share your examples too. We've picked three of the best and covered them below; these examples really showcase the power of simple but thoughtful customer communications. This could so easily have been a generic customer communication but the style and tone make it feel very genuine, fun and actually quite exciting. Who wouldn't get giddy at the prospect of a new pair of glasses to go with their new prescription. Essentially the email is upselling eye appointments and glasses but it doesn't feel like a sales email. The tone and timing make it extremely valuable and relevant to the reader. In summary, this short email does it all - reminder that your prescription is running out, tick. Convenient way to make an appointment, tick. Deliver the exciting prospect of getting some new glasses, tick! This email correspondence is a perfect example of the great things that can be achieved if you empower your customer service team. No matter how the customer service representative had put it, asking Michael to pay to have his watch repaired after he'd been involved in an accident, would undoubtedly seem a little callous. Instead Timex have made Michael's day and shown on a very profound level that they understand their customers and care about them too. It wouldn't have had the same impact if Judy had to check with her manager that she was allowed to offer the repair free of charge. We couldn't resist sharing this extremely simple example. 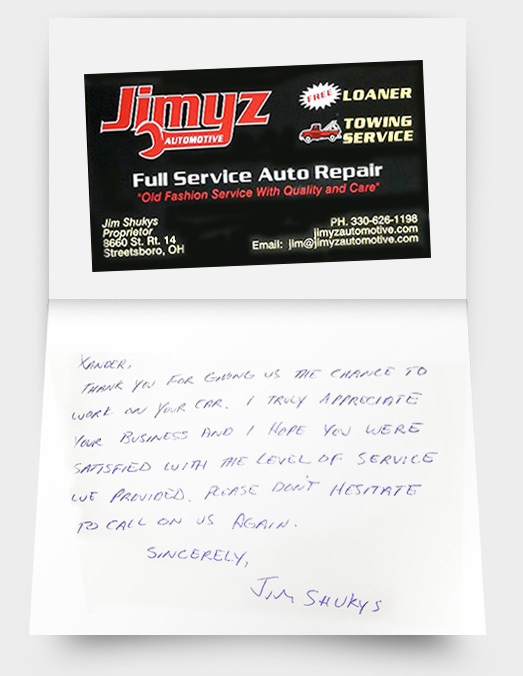 Jimmyz Automotive sent their customer a personal handwritten thank you note. OK, so we're not sure they do this for every single customer and of course a large international retailer would have to factor in the time it takes to write these personal notes, but the sentiment is perfect and sums up nicely what makes great customer service. This level of personal gratitude is so rare it clearly made this customer's day - as well as the headlines - nd here we are blogging about it on the other side of the world. We hope this blog and our report have inspired you. If so, why not get in touch for a chat about your ecommerce site to see if we can inspire you further.